Tag line: "An honest man caught in a world of intrigue, power and passion"
A police mystery. A revolution. Terrorists. Martial law. These are he primary elements that make up The Dancer Upstairs, the directorial debut of actor John Malkovich. 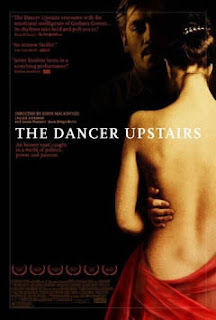 Effectively depicting all the bloodshed you'd expect to find in a film about a political uprising, The Dancer Upstairs also approaches its subject with an artist's eye, creating a very unique thriller in which style and mood play a significant role in relating this story of brutality. In an unspecified Latin America city, Police Detective Agustín Rejas (Javier Bardem) is assigned the task of tracking down the mysterious revolutionary known only as Ezekial, who's been wreaking havoc throughout the country, sending children to bomb local stores and lining the streets with dead dogs, hung by their necks from telephone poles. The entire nation is crippled with fear, wondering where the dreaded radical will strike next, and the newly elected president has threatened to declare martial law if Ezekial is not soon captured. Rejas and his partner Sucre (Juan Diego Botto) put in a lot of overtime on this difficult case, hoping to bring Ezekial to justice before soldiers are sent in to police their streets. There is violence in The Dancer Upstairs, yet each violent act is countered by the calm introspection of Bardem's Rejas, who, in trying to find a logical center to the attacks, attempts to equate the current revolutionary actions of Ezekial with similar uprisings that occurred throughout history. Hoping the past will, in some way, shed light on the revolution that’s crippling their nation, Rejas' line of thinking breaks with everything the police know about Ezekial, who, up to that point, seemed to be stirring up trouble without any cohesive plan. But as Rejas sees it, the most arbitrary acts could be rooted in the past, and history may just be their best tool in deciphering Ezekial’s true manifesto. It’s through references such as these that The Dancer Upstairs anchors itself firmly on the side of reason, even with anarchy being the apparent rule of the day. With The Dancer Upstairs, Malkovich shows great skill behind the camera, bringing an almost dreamlike atmosphere to a world of chaos and despair. Along with the search for Ezekial, The Dancer Upstairs also explores the relationship that develops between Rejas and a ballet instructor named Yolanda (Laura Morante), whom he meets one day while picking his daughter up from dance class. In what I believe is the film’s most striking image, Rejas and Yolanda are sitting on a rooftop in the darkness of early morning, a point from which they can see the entire city. Suddenly, all the lights below them go dark, and fireworks, which Ezekial's followers use to celebrate each successful terrorist “event”, light up the sky. Even though something horrific has undoubtedly just occurred somewhere in the city below, Rejas is not distracted. He reaches over and strokes Yolanda’s cheek as the colorful display explodes above their heads. This scene, which enhances the side story of Rejas and Yolanda's romance, is reflective and subdued, one of many such moments that introduces an air of calm to an otherwise volatile situation. For a directorial debut, the skill on parade in The Dancer Upstairs is magnificent. John Malkovich has always been one of the cinema’s most distinctive actors. Here, he adds his unique style to a film while working entirely behind the scenes, and does so wonderfully.